Your name embossed on a standard tag. A key fob / name tag embossed with your name in a choice of colours. Size is 65 x 25mm. 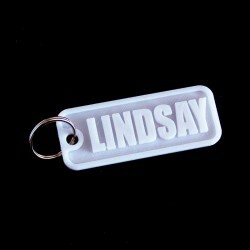 Your name will be sized to fit the space available on the tag and will be embossed in all capitals. Comes complete with stainless steel split ring. Enter your name or text in the customisation box below. Then click "Save" before adding to the shopping cart. Your chosen name & colour will be confirmed at checkout.